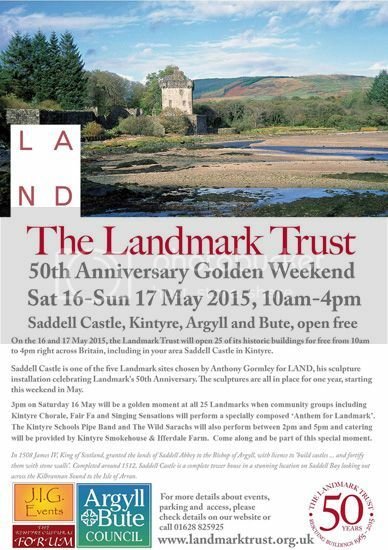 The Landmark Trust are holding their Golden Weekend on May 16th & 17th at Saddell when Saddell House and Castle will be open from 10am - 4pm. As part of the celebrations there will be an event on Saturday 16th from 2pm - 5pm featuring the Kintyre Schools Pipe Band, the Wild Sarachs and Paula McLean will lead a 70 piece choir consisting of members of Kintyre Chorale, Fair Fa and Singing Sensations. The choir will perform a specially commissioned piece of music at 3pm to celebrate the 'Golden Moment' when this piece of music will be performed at 25 sites across the British Isles with this site being the only one in Scotland. Catering will be provided by Kintyre Smokehouse and Ifferdale Foods in the afternoon. Parking off road will be just through Saddell in the field up beside Saddell Abbey. This will be signposted and marshalled but please drive carefully when approaching the area. Thanks. As part of the celebrations a specially commissioned sculpture has been created by renowned sculpture Antony Gormley and erected in Saddell Bay beside the Castle. It will remain there until May next year. The celebrations are being co-ordinated by Iain Johnston of J.I.G. Events and the Kintyre Cultural Forum. Special thanks to the Argyll & Bute Council for their help with the project, the British Legion for helping marshal the event, the staff of Landmark Trust and everyone else who has helped put this weekend together.